I received this wonderful submission made by Liz M. from England! 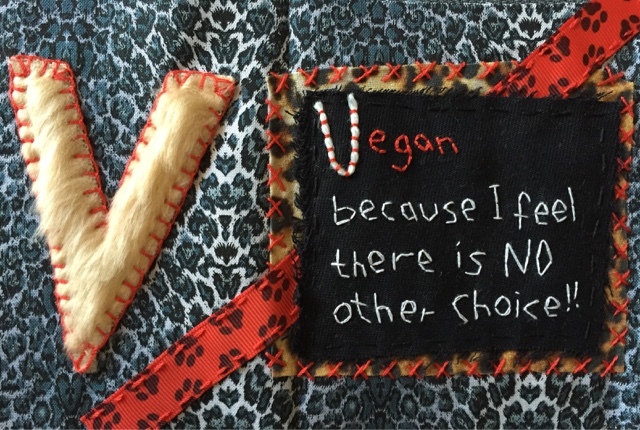 Liz says, "my designs were inspired by the animals that I hope I play a part in saving by being vegan - not just the animals being slaughtered for food but also animals used in entertainment, etc. I became vegan at the age of 15 when I realized that the animals on my plate were no different from the animals we had as family pets. I couldn't be part of that anymore. I like the idea of vegan craftivist projects because I want to feel useful and feel like I am still part of a movement even though I am physically unable to be part of a lot of actions. Everyone has something to give in life."